Give a horse that extra winning gloss, or keep your horse clean when ever stabled. Includes cross surcingles, tail flap, shoulder lining and a removable neck cover. High cut neck & V-front closure, 1200D polyester outer with polyester lining and front leg arch. High cut neck design and V-front closure for a snug fit, 1200D polyester outer with polyester lining. Surcingles fasten straight, extra depth allows the flysheet to be wrapped around the horse's belly. Lightweight & made from hi-tech nylon outer 150g fiber fill, this hood offers durability at its best. New & improved with 210D polyester ripstop outer & 350g fiberfill with classic original cut. New & improved with 210D polyester ripstop outer & 200g fiberfill with classic original cut. A great new addition to the Amigo Mio line, the stable sheet is cut in the classic original shape with silky shoulder lining for comfort. One piece insulator provides full body comfort, with 210D ripstop outer and 350g fill, new color. One piece insulator provides full body comfort, with 210D ripstop outer and 200g fill, new color. Hi-tech nylon outer shell and nylon lining, helps keep coat smooth & shiny, classic original cut. Lite stable sheet with durable polyester & classic original shape, silky shoulder lining, double front closure. 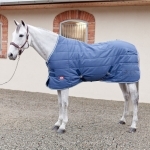 Classic original cut, straight front closure & 2 belly surcingles with tail cord keep this stable blanket in place. Classic European cut, 100% durable cotton body with silky shoulder lining. 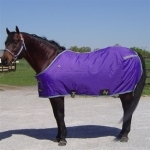 For the broader horse like warmbloods & drafts, with 210D ripstop outer & 350g polyfill, in new color. 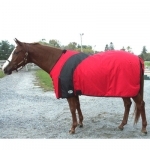 For the broader horse like warmbloods & drafts, with 210D ripstop outer & 200g polyfill, in new color. Stable blanket with cross girths & elastic leg straps, 250g polyfill. 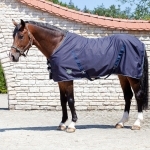 WEMBLEY Summer blanket will protect your horse from insects & UV rays. Waterproof & breathable 1200D rip-stop nylon shell, 300g fiberfill & a 70D lining polishes coat. A contoured back and fleece at the withers, 420D nylon outer, 300g fiberfill & 70D nylon lining. High performance moisture wicking medium weight blanket can also be used as a cooler or blanket liner. Softshell is durable, lightweight & breathable outer, with eco-friendly therapeutic bamboo fleece lining.